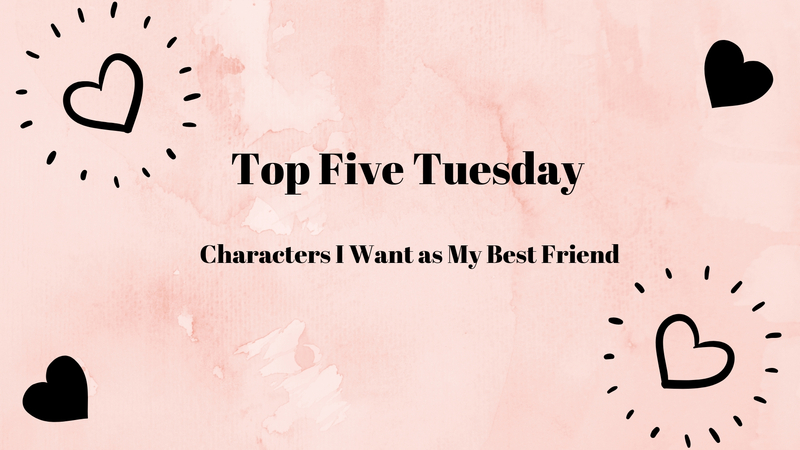 Top Five Tuesday is hosted by Shanah @ Bionic Book Worm. I love this theme and I tried to be as realistic as possible when it came to this list. Sure, I might admire a character… but simply from afar, because I know that I wouldn’t want anything more than that with certain characters. As you will see, I place much importance on a good degree of sociability, warmth, FUN, openness to new experiences (but grounded too), and loyalty. But, most importantly, being an actual friend and being courageous. You can have the mind and heart of a Ravenclaw/Slytherin/Hufflepuff, but you must have the spirit of a Gryffindor. Hands down, no competition. If you haven’t read the book, then you must have seen the film (Stand By Me) at the very least, I’m hoping. Chris Chambers is the embodiment of what a friend should be. When Teddy stands on the train track waiting to dodge the train, he very rightly tells him to stop being stupid and get off it before he kills himself. When Gordie is worried about being weird, Chris tells him that everybody is weird. When Gordie wants to drop his classes, Chris tells him he’d be idiotic to throw away such an important opportunity, tells him that he has a gift for writing and that he should pursue it no matter what anybody thinks. He’s there for his friends, he has a big heart and he is a straight-shooter to boot. And, you know what? The same applies for Gordie, he stands up for Chris when Ace threatens them, he tells Chris he is more than the bad reputation of his family and he is capable of so much more, and he comforts Chris when he cries. If I had to recommend a film to propel our feminist movement and highlight how we embrace and strive to dismantle the stigma of “men do not cry” then this is the right film. This book, this film and these characters especially Chris and Gordie taught me what it really means to be a friend. I, also, want to add that personally, I believe the whole “Oh, my God, I’m so much weirder than everybody else” is a whole load of nonsense. There aren’t degrees of weirdness, there’s just different types of weirdness and you just gotta find the ones who are on the same level of weird as you. Steady, mature, calm, logical and fairly sociable, there’s no Jane Austen heroine I admired more than Elinor Dashwood. I literally read the pages in awe and with a huge smile on my face. Elinor is very much like Professor McGonagall and her quiet strength and levelheadedness would be a perfect balance to my Marianne-ness. Realistically, she is also the kind of people I naturally gravitate towards in life, so that helps too! What I love about Ginny is that she is so straightforward and for a classic overthinker (and sometimes an underthinker) like myself, I know that I wouldn’t have to overthink around Ginny. Yes, sure, she can be mean, but my girl never pretended to be morally and righteously superior to others and personally, teasing people is my way of showing affection and so me and Ginny basically share the same love language. Also, I usually don’t understand sarcasm, but I understand Ginny’s (and Chandler’s) and sharing the same sense of humour is a must. And she’s much more understanding than she’s made out to not be, as we saw when Harry was raging and Ginny listened and then she gave her opinion and thoughts on the issue. And she plays sports. Now I love obstacle courses in particular, so we would actually share common interests, and I could definitely see myself going to Go Ape with Ginny. Plus, I could attend parties with her. Yes, I would actually enjoy being friends with Ginny. I would have fun. Side note, my friend went to the same university as Bonnie Wright and often found her in the library! How cool? Louisa is a big ball of fun, warmth and compassion. But the icing on the cake for me is that despite her initial stubborn hold on her beloved traditions and comfortable ways, she slowly begins to embrace new experiences and new ways of thinking after meeting Will. Can you imagine all the fun me and Louisa could have? It’d be a great balance of the new and the old with our friendship and would make for interesting and exciting conversations! It would be a very well-rounded friendship. Even the coldest heart would be pierced by Violet’s warmth. She is understanding, compassionate, intelligent and it’s hard to explain, but I absolutely loved her. She is such a strong, mature and loving person, and it takes a lot of courage to be there for someone even in the most difficult of times and plenty would have fled, but Violet? Finch taught her to live again, and damn it, she would be try to do it for him too. She is a friend, a true friend. I found this quote from All the Bright Places in Goodreads (below) and also finally found my copy of the book which had been lost for a very long while. So, yep, very happy. I tried to make the most of Canva and it was really hard! My one (in the featured image) ended up looking so bare and plain, so Canva aficianado’s, please teach me your ways! Who on my list do you like and why? Who else would you add to the list? Let me know in the comments! Next Personality Test: Get to Know Yourself! I haven’t read The Body. I didn’t know the film, Stand By Me, was based on a book! And moreover, that book was written by Stephen King! I have never read his work but he’s my friend favorite author, so this might be a good opportunity to try it. Yay, I’m so glad you’ve watched it, your English teacher knows his stuff. 🙂 I completely agree, those two together is the stuff of true love, friendship and soulmates. They’re both such amazing friends, so much to learn from these two. As for your list of honorable mentions: How could you fail to include the noble, courageous, brilliant, humorous, and infinitely just Tyrion Lannister? I’m aghast! One of my favorite Tyrion quotes: “That’s what I do. I drink, and I know things.” Ha ha ha! Exactly! We’re all mad here. Great quote, when I worked at Waterstones all the booksellers recommended Olive Kitteridge as a must read, so I need to read that one day, for sure. I absolutely love Tyrion but I fear we are far too alike, except he is so far above in intelligence, and we might have some squabbles because of that. She’s a gem of a bookworm. Now that I’m a bit less immature I should probably try re-reading Sense and Sensibility. That was a huge failure when I was much younger. Reading Jane Austen made me want to cry tears of blood. Elinor would tell her the truth, for sure, but I also think just like Lou, Elinor is traditional and cautious of new experiences and you know what they say, opposites attract. Lou!!! I would definitely be bffs with her. She’s so joyful and upbeat haha. Idk if I’d want to be friends with Violet though.. The ending is different? Omg. Is it depressing? I am not ready lol. such a cute post, girl! Oh, I am so with you on Ginny and Louisa Clark! Also, I wish I knew how many times I was shocked to find out Stand By Me was based on a Stephen King novel! But, I understand your answer of Chris. I feel like he’d be an amazing friend (based on his character from the movie at least)! I am so there with you about Chris Chambers!!! What a good freaking kid (and then adult and now I’m *gross sobbing). I would also love to be friends with Ginny (and Neville and Luna and Hagrid and Remus lol). Fred and George would be so much fun to hang around, Luna for interesting discussions and Hermione… erm, nah, that girl is too serious. Annabeth is cool, she’s very mature for someone her age and Clarisse would be great company! And I have no idea about Girl Online series, I think it’s Zoella but I don’t know, she’s never intrigued me. I really liked Hermione in book 1 & 2 after I got over the frenzied nerdiness and by the end of Book one, I thought she was quite endearing. But after book 3, she just got worse and every book highlighted the many problematic things about Hermione. Whereas I hear Clarisse improves and Annabeth is already very mature, rational and open-minded.